It's Halloween 1989 and Sam and Josh are attempting to have one more memorable Halloween before graduating from high school. On their way to a rock concert, the two and a few friends find an old abandoned barn and accidentally awaken the evil creatures that lay dormant inside. Now they must protect their friends and the local town and defeat an evil curse before it's too late. Writer and director Justin M. Seaman and the film crew involved did a remarkable job setting the tone and look of The Barn. Not only does the film look like it takes place in 1989 but it looks like it was filmed in 1989. 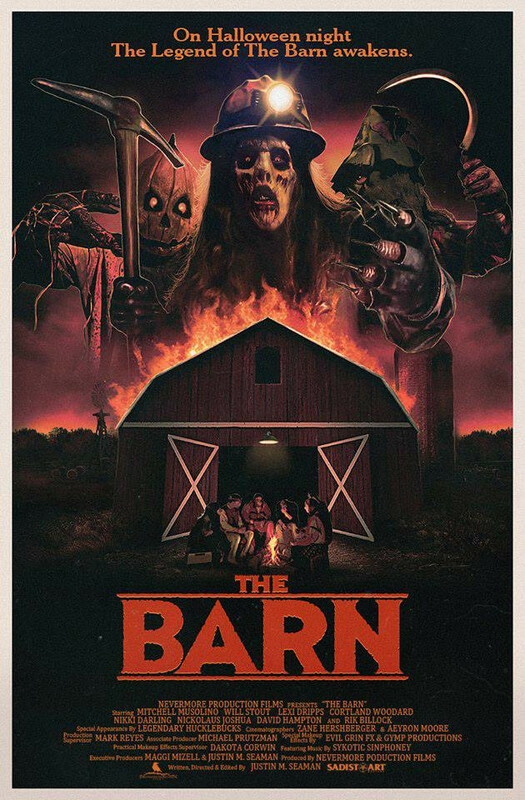 It's apparent from the beginning that The Barn is an all out love letter to Halloween and the filmmakers don't hold back as the movie seems to be taken right out of our memories. From the cheap devil and skeleton face masks with thin strings to fit over your head to the decorative and colorful cardboard cut outs of smiling pumpkins and black cats, The Barn felt like Halloween when I was kid. The film also makes use of all the Halloween specials associated with the holiday by creating the perfect late autumn atmosphere to fit the season. We are treated to the sound of distant crows and dried leaves crunching underfoot as well as gray skies and cornfields lined with old wooden fences. Like I said, it's a pure love letter to Halloween. 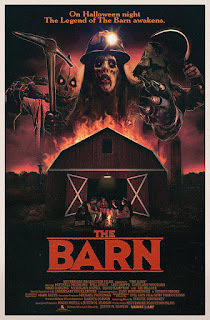 To top off the 80's tone The Barn features appearances by Linnea Quigley and Ari Lehman. They both add a nice touch with Quigley playing against her sultry, scream queen persona and Lehman playing right into his loud, rock and roll image. And the music? Perfect! As the first and second acts play out, The Barn is nothing short of a complete and total blast. To top off the wonderfully nostalgic and brilliantly realized 80's Halloween look, there's a story involving some new legends and folklore associated with Devil's Night as well as some rules that Sam (Mitchell Musolino) made up as a child. This nice mix creates a new and interesting story to be told and Justin M. Seaman does a fantastic job of both setting the story up and setting it into motion. When the creatures come out to wreak their havoc the fun manages to kick up another notch. The creature designs are just awesome with a great mix of make up, costume design, and a touch of visual effects. They're memorable, they're scary, and I want to see more of them! The practical effects and gore is yet one more thing that will have fans smiling and yelling in their seats. The filmmakers demonstrate a strong and loving knowledge of 80's horror and I was in complete indie horror, Halloween heaven during the first two thirds of The Barn. The unfortunate part of The Barn is the final act. The last 30 minutes feel just as long as the previous 60 as Sam and Josh figure out how to fight off the evil creatures. One problem is the ways they fight them off aren't creative or fun but rather very straightforward and frankly pretty dull and uninspired. For a character as creative as Sam with all his rules he made up to prevent the occurrence of ancient Halloween legends, I thought perhaps the ways of stopping these evil creatures would be more inventive. Another issue that plagues the final half hour is the pacing. There were a few times where it felt like the film was ending only to gear up again for more action. I didn't feel as though each scene moved the action forward very effectively. It instead felt very choppy and back and forth trying to get to the end, which did have a nice little moment of revelation and keeps The Barn open for a sequel. With no bad performances and a fantastic first hour full of everything you'd want from a Halloween movie coupled with inventive creatures and great special effects, I'll gladly say The Barn is worth a watch. It's a shame the last half hour has the pacing issues and loses steam as much as it does because instead of being just worth a watch, The Barn could have been a classic.